Move entries up and down to be in the same order as your bank's web page. You can add as many columns to the right for comments or other information as you need. The order of the entries is the same as you find on a typical bank statement web page, with the latest transactions on the top. The latest (top) processed row is automatically colored green. Transactions that have not been processed by the bank have an expected date and are placed above the processed transactions. The first button inserts new rows whenever needed. The next two buttons allows one to move rows up or down. The last button displays a menu of options. To balance your checkbook, just enter the transactions that your bank shows. Then arrange them to be in the same order as the bank's web page. If you use the option on your bank's web page to show the ending balance by transaction, then you can easily see if you and the bank are in balance. One really neat feature of the Checkbook Assistant is the auto date arrangement feature. 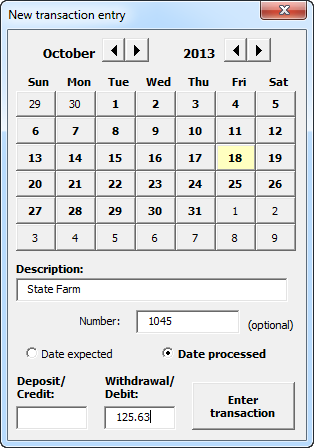 When you enter a date in the Date Expected column or the Date Processed column, it will move the row to be in date order. Download Now - the Checkbook Assistant is free - no purchase required. Does not expire.